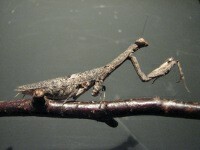 Ambivia is a twig-imitator. Their form and colour perfectly fits them as a small twig. These mantids often spread their arms wide away. They live in bushes and small trees, also near to coasts. The aggressiveness of this genus is middle to high. Thus, they are not adequate to be kept in groups. Just nymphs up to L5 can be kept together. At present, just 2 species are described: Ambivia parapopa (WANG, 1992) and A. undata (FABRICIUS, 1793). Ambivia is a faszinating genus with an interesting camouflage-behaviour. In case of danger, they extend their arms to mimic a twig, even when they eat.